It’s Wida and today is my day to show you some fun ways to give gifts. 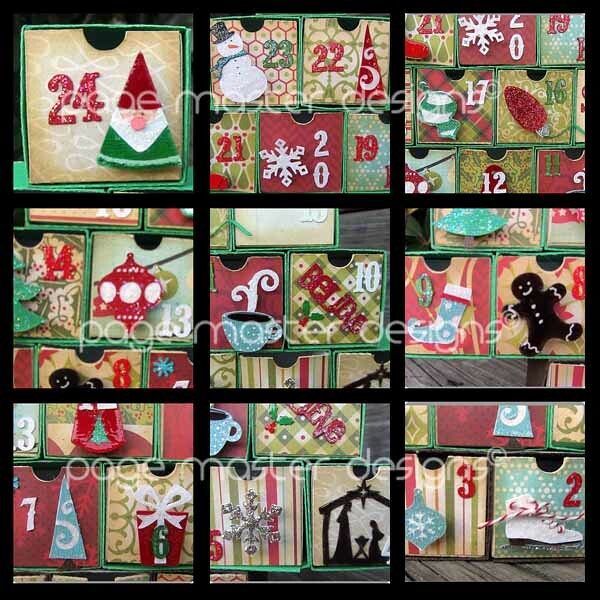 I chose to focus on my favorite old and new Christmas stamp sets from Hero Arts and the most common way to give… gift cards. 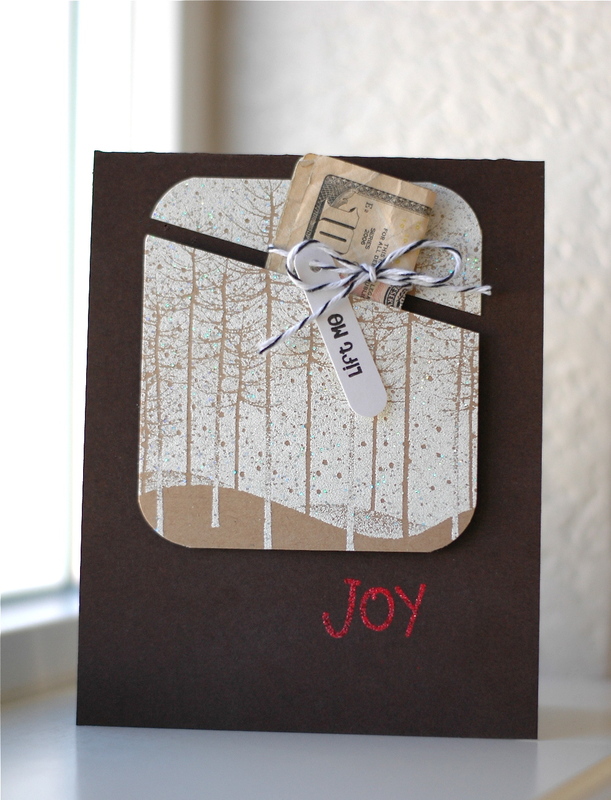 First up, I cased myself based on THIS card and made a gift card holder to hold some good ol’ fashion cash!!! 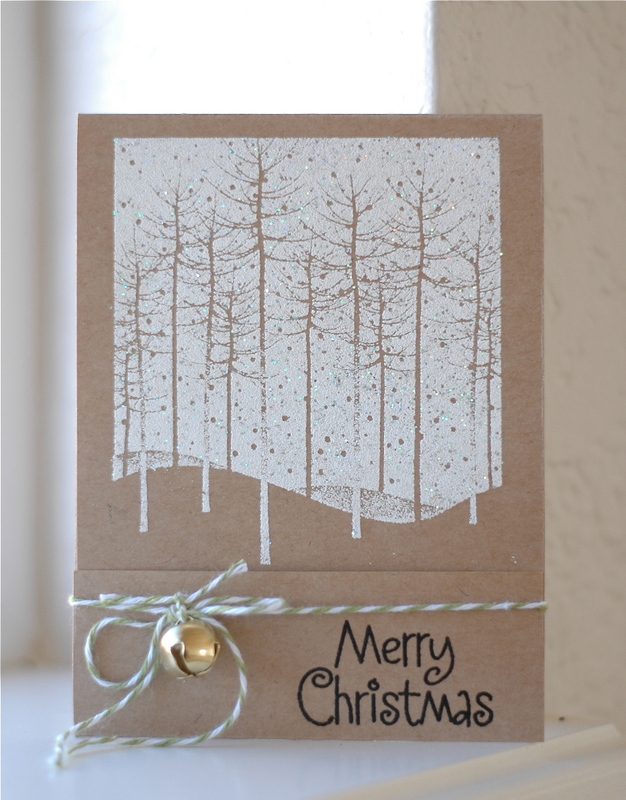 to make this card, I used a new embossing powder. It makes the trees glisten! Next up, I made a matchbox gift card holder. You can find tutorials online. For this one, I cut the cardstock to measure 3 3/8x12in and scored at 5 1/4 and at 1 3/8. I only made it this weird size because of the stamp I used, you can make the measurements more general/easier for your own matchbox card. I secured the lower portion with the twine. You could use staples or really sticky tape. Insert a picture, cash, or a gift card! in this photo you can see the die cut better and can get a peek on what the inside looks like! I used the snowflakes from owl Christmas, a file tab punch and some alphabet dies from PTI to create the outside. The snow flakes were embossed using the same ranger snowflake powder. When you open the card, you get a 3D surprise! I left mine blank on the inside to write a message, but I have seen people decorate the inside as well. I hope you liked my presentation today! Please do visit my blog here: BEACHORADO. And special THANKS to Linda and Mary Dawn-A Blog Named Hero for asking me to participate in the fun! 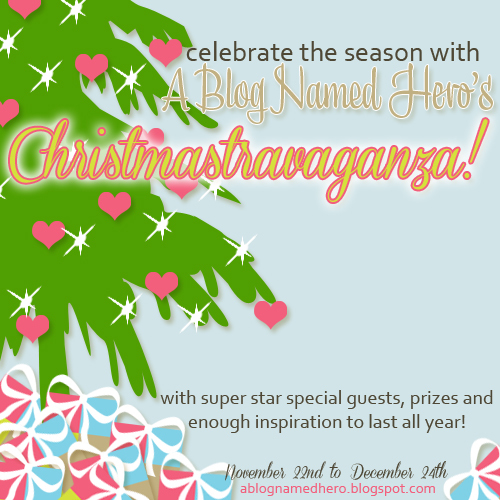 Welcome to Day 3 of A Blog Named Hero’s Christmas-travaganza! I hope you’re enjoying what you’ve seen so far and getting lots of ideas for the holidays. Here’s one of my projects–table placecards. 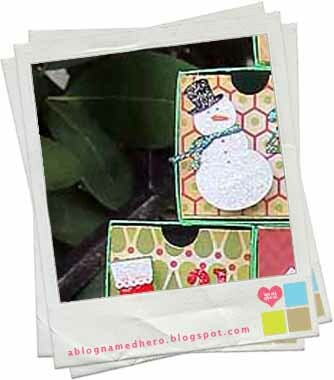 I used the adorable snowman that comes with a matching die and used the partial die cutting technique. I first learned about this technique from Amber Daigre in the online class A Cut Above. She shares a picture tutorial here on her blog. Basically, you line up the die on your cutting plate (of your Big Shot or Cuttlebug) so there is only a partial cut that will extend beyond the fold. The snowmen were colored with Copics and the holly on the hats were stamped in green, trimmed and attached to the hat. You could easily make cards with this technique, too. Just change the size of your card base and allow for the height of the snowman so that everything will fit in an A2 envelope. Speaking of cards, I made one with an extra snowman. I inked up the Snow Dots background and let it fade on the bottom so the sentiment would be easier to read. Love this little guy! His shape reminds me of a marshmallow, and having the matching dies makes working with him a breeze. You can easily crank out a bunch of projects in no time at all. Drop by tomorrow to see more projects and ideas leading all the way up to Christmas! And be sure to leave comments as there will be PRIZES galore! Hi it’s Therese from lostinpaper and it’s soooo exciting to be with you here today sharing all the fun in this Christmas-travaganza at A Blog Named Hero! Today I’ve made a video to share with you some quick CAS tags that I made using some wonderful Hero Arts products. I don’t know about you, but time seems to speed up in December and I think it’s great to have something that looks fab and is easy to mass produce when I start freaking out…. This Christmas-travaganza runs until December 24th with a different designer every day…. amazing! And don’t forget to leave comments as there will be PRIZES! I hope that you are on track with all your Christmas plans and find some time to relax, have fun and of course craft! Thanks for visiting and a HUGE thanks to A Blog Named Hero for including me in this fantastic event! Other Supplies: Copics YG03. Martha Stewart Seam Binding – Red. Hole Punch. Vanilla Embossing Powder (AnnaBelle Stamps). Hi Bloggers! It’s time. It’s here!!!! I am SO excited to be here today to kick off our month long CHRISTMAS EXTRAVAGANZA!!!! From today and all the way to Christmas Eve we will have new inspirational gift ideas for you to make or give away this holiday season! There will be give-a-ways too, so be sure to read all the way to the bottom of this post. So what do you say we get this party started??? 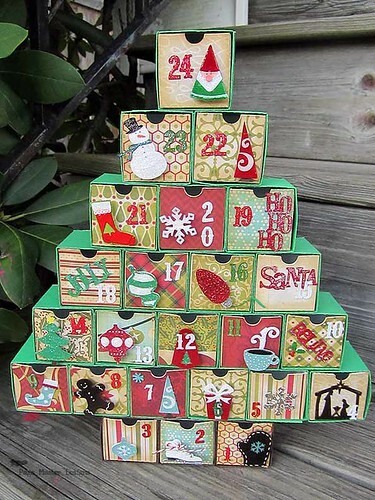 Today I am sharing an Advent Calendar that I created using Lori Whitlock cutting files, Hero Arts paper and ink and Echo Park Paper designed by Lori Whitlock. First I would like to say, I am a HUGE Lori Whitlock fan. I own almost every single one of her designs. I love Lori’s designs as much as I love Hero Arts stamps. They are by far my two favorite companies to play with and it was a match made in heaven for me to combine the two for this project. I used this file from Lori Whitlock: One Drawer Box. If you have a Silhouette it is available in the Silhouette store. If you have a different electronic die cutting machine, you can purchase it from Lori’s webstore. She has SVG, DXF etc. I started by making 21 boxes out of green cardstock. I made 3 out of brown cardstock. All the little icons & numbers were cut out of Hero Arts Snow Layering paper and then colored with ink or Copics. It was just easier for me to cut out of white paper that cut crisp than to try and cut tiny details out of a thicker cardstock. To make sure that the patterned paper on the fronts of my drawers were cut to the exact size I made modifications to the boxes in my Silhouette Studio. Here is a quick video to show you how to make them. It was so very simple to make. 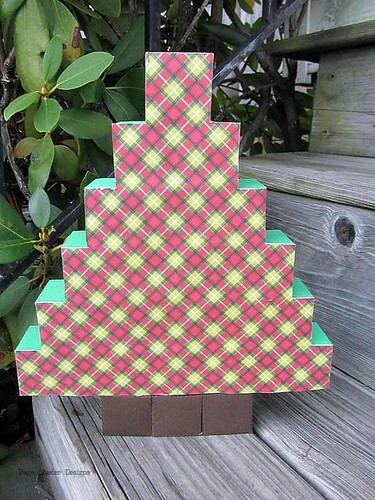 * place the boxes in the shape of the tree then lay your patterned paper on them so that you can make sure your colors are balanced before you adhere them. GIVE-A-WAY!!!!! Follow the Rafflecopter directions to enter the give-a-way. If you leave a comment on this post you will receive ONE entry to win a $10 gift certificate to Lori Whitlock’s online store. BUT…If you comment every day during the extravaganza you will have a total of 31 chances to win prizes!!!!! Check out Rafflecopter on how to earn even MORE entries!!! I kick things off at 5:00 p.m. Here is a quick sneak for you…. Happy Thanksgiving Day to all our U.S friends. Eat turkey, see family and then come be inspired!! !